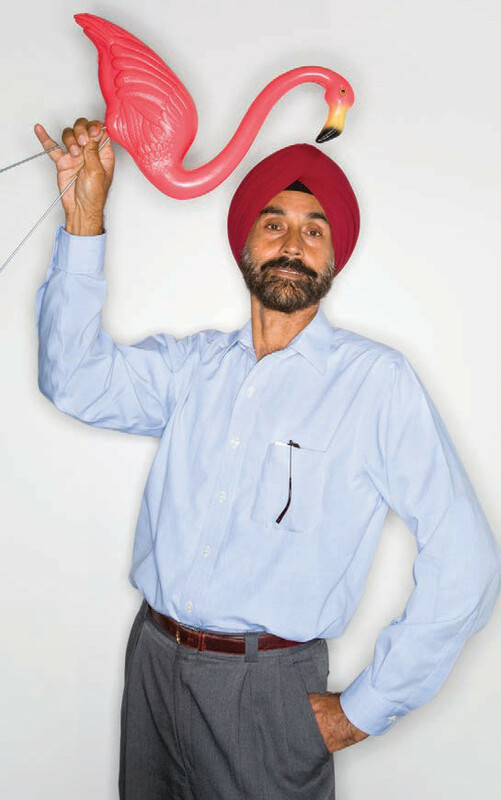 Don Featherstone, the inventor of the plastic flamingo, once said he “brought poor taste to the poor people.” Before his Pepto-pink plastic creations popped up like weeds in low-rent lawns, only the rich, who exhibited expensive sculptures on their estates, could afford lawn ornaments, Featherstone said. 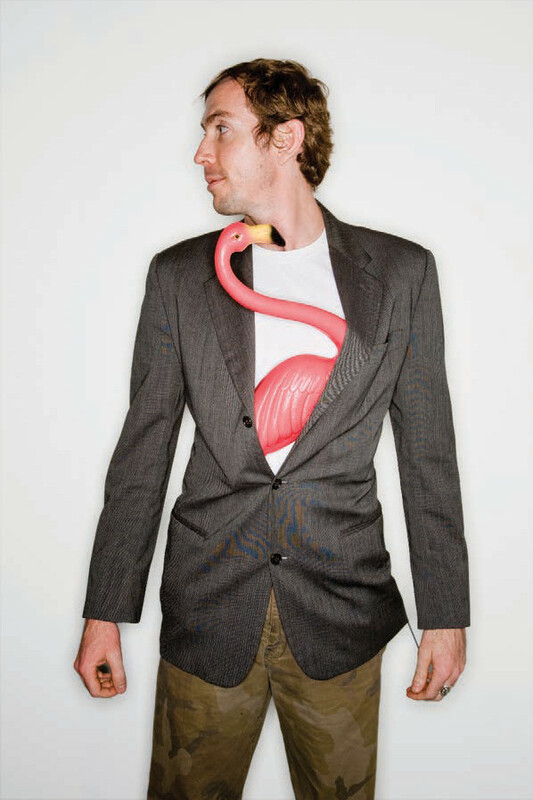 Poor taste and poor people aren’t usually associated with Palm Beach County, but Featherstone’s flamingos winged their way into our hearts – and our art. South Florida Cultural Consortium Visual Artists Fellowship winner Sarah Knouse won critical acclaim for her witty sculpture, “Pastoral Flamingos.” The plastic flamingos seem to be melting in an upscale swamp. 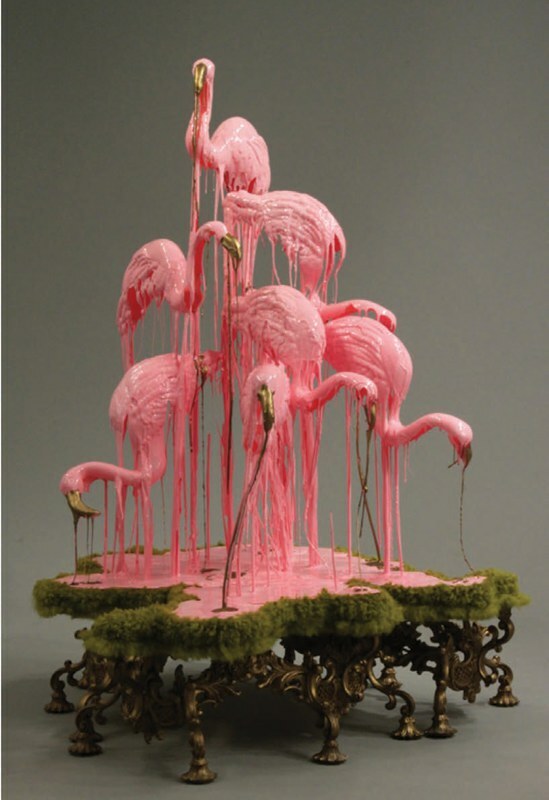 The materials for “Pastoral Flamingos” – cast plastic, shag carpet, faux gilding paint – are deliberately tacky. Knouse created the mixed-media work and its many editions from 2010 to 2013. The sculpture has been exhibited nationwide. 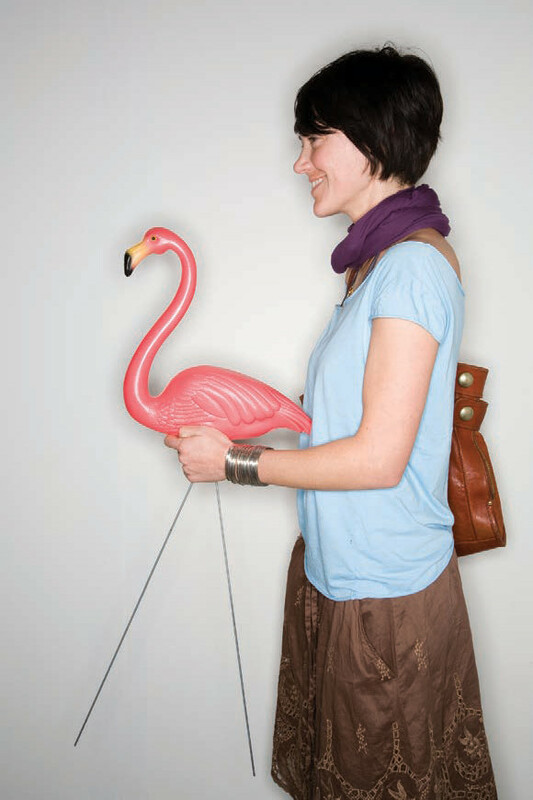 Lake Worth photographer Jacek Gancarz shares Knouse’s fascination with plastic flamingos. 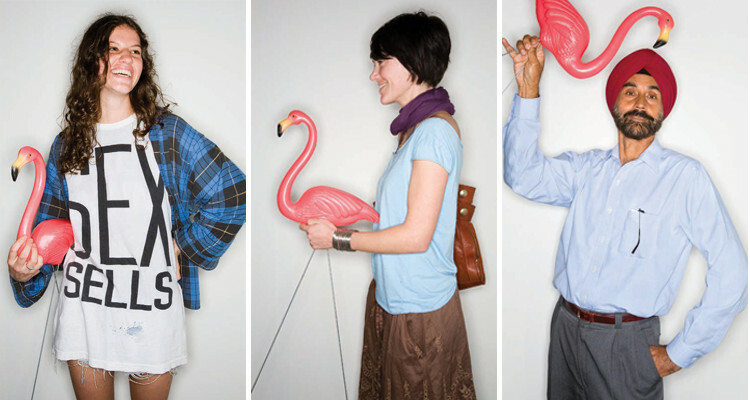 “After attending Art Basel Miami Beach,” he says, “the idea popped in my head: What better place than a contemporary art fair to grab interesting-looking people and hand them a kitsch icon to pose with?” As if finding the right place was the only thing that had been holding him back. Then there’s Mother Nature’s work of art – the American flamingo. The flamingos at the Palm Beach Zoo & Conservation Society in West Palm Beach are ready for their close-up now thanks to a little nip and tuck. “Two sides of the boardwalk in the zoo’s flamingo habitat were replaced and we’ve added a nice bench where you can sit and watch them,” says Claudia Harden, the zoo’s marketing manager. The changes – which the zoo is proud to report were made with environmentally friendly materials – allow visitors to get closer to the colorful birds. This winter, when the section of the zoo dedicated to Florida wildlife gets a redo, the flamingo habitat will get a full facelift. Also looking good are the wild flamingos that returned to southwest Palm Beach County after a century-long absence, says Susan McKemy of the Audubon Society of the Everglades. Naturally, these Palm Beach County flamingos reside in an exclusive residence with restricted access: South Florida Water Management District Stormwater Treatment Area 2. The Audubon Society conducts guided carpool birding tours to the remote location. The ASE “has received 1,200 requests from the Netherlands, Germany, Portugal and Canada, as well 21 states,” McKemy reports, verifying the international – if not universal – appeal of the pink birds. More than 620 people ventured into the western reaches of the county on 13 trips the organization led between March 7 and May 2 of this year alone. Some birders were disappointed. In April, however, a pair of flamingos was caught in the throes of passion, possibly the “first time flamingos have been observed and documented mating in the wild in Florida,” according to McKemy. Those frisky Palm Beach County flamingos may have racy backgrounds. 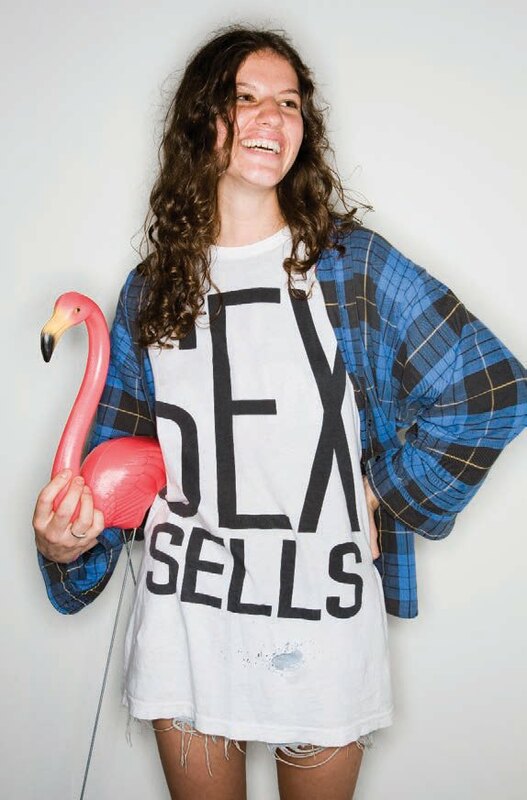 Check out Sarah Knouse’s melting flamingos and other works, which were included in New Art: 2015 South Florida Cultural Consortium Visual and Media Artists Fellowship Exhibition recently on display at the University Galleries at Florida Atlantic University in Boca Raton, at SarahKnouse.com. The South Florida Water Management District has contracted with the Audubon Society of the Everglades to conduct birding tours into Stormwater Treatment Area 2, a restricted area. ASE offers monthly guided carpool birding tours into the area from October through April, with more tours in March and April, the mostly likely time to see the American flamingos. ASE cannot guarantee that flamingos will be seen. For more information: AudubonEverglades.org. See the flamingos at the Palm Beach Zoo & Conservation Society in West Palm Beach strut their stuff 363 days out of the year (364 in every leap year). During the Flamingo Keeper Talks, offered daily at 10 a.m., those who keep the birds in the pink share fascinating facts about their feathered friends and feed them. For more information: PalmBeachZoo.org.